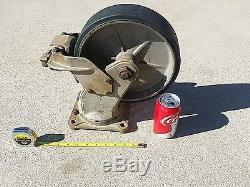 4 Heavy Duty Aerol Wheel Casters for multiple applications. These are very strong made from high quality materials. Able to swivle 360 degrees, equipted on a heavy duty mouting plate. All wheels have working foot locks/brakes. Mounting plate bracket measures 6.75" X 5.75". Grease zerk service joint on wheel. Made in Los Angeles, California! Each Wheel Rated around 6400 lbs. Please understand that no emails will be replied to during the weekend and on holidays. It varies from item to item. Please read the item description thoroughly. We are not responsible for any labor involved. In the case of a defective item, we guarantee exchanges. We are not responsible for the labor that's involved. In order to have a valid defective claim, the item must be intact and untampered with. If anyone has tampered with the unit in any way, the claim will not be accepted. Before sending you a replacement, we will have the defective item picked up. We advise you to read the description very carefully. All information regarding condition of the item and application are explained there. We cannot accept any C. Boxes, please make sure you do not supply a P. Upon receiving your order, inspect it immediately. If damage to parts is discovered, DO NOT send any parts back to us. You must file a damage claim with the carrier. Do not dismantle the package; but instead keep the parts and packing material as close as possible to the original received condition. The carrier must determine how the damage occurred. Without the original container and packing material, your claim will be voided by the carrier. Damaged or missing parts must be reported within 10 days of receipt or claim will be voided. Missing parts may have come out of the packaging during transit. The item "4 Aerol 10inch Caster Wheels Heavy Duty With Locking Brakes Rubber" is in sale since Wednesday, April 26, 2017. This item is in the category "Business & Industrial\Other Business & Industrial". The seller is "nev-guy" and is located in Chandler, Arizona. This item can be shipped to United States, Canada, United Kingdom, Denmark, Romania, Slovakia, Bulgaria, Czech republic, Finland, Hungary, Latvia, Lithuania, Malta, Estonia, Australia, Greece, Portugal, Cyprus, Slovenia, Japan, Sweden, South Korea, Indonesia, Taiwan, Thailand, Belgium, France, Hong Kong, Ireland, Netherlands, Poland, Spain, Italy, Germany, Austria, Israel, Mexico, New Zealand, Singapore, Switzerland, Norway, Saudi arabia, Ukraine, United arab emirates, Qatar, Kuwait, Bahrain, Croatia, Malaysia, Chile, Colombia, Costa rica, Panama, Trinidad and tobago, Guatemala, Honduras, Jamaica.